Plastic Pallet with Fork Pockets | Remcon Plastics, Inc.
Our flat deck pallet with easy-exit fork pockets is made of FDA-compliant polyethylene and is designed for safer forklift handling in higher racking systems and on conveyer systems. Our easy to clean, FDA-compliant polyethylene pallets have no crevices or holes for contamination to hide, last substantially longer and are more durable than injection-molded counterparts, and will not leave splinters or nails throughout your facility like wood pallets do. Fork pockets allow easy 4-way entry and safer forklift handling, especially in higher racking systems. Unlike similar pallets these fork pockets are specifically designed for easy entry and exit of pallet jacks. Continuous bottom rail provides stability on conveyer systems. No lip makes this pallet ideal when items on the pallet need to overhang the pallet. Durable double-wall construction rotomolded pallet resists cracks, dents, and provides better durability than injection-molded or wood versions. Safer than wood pallets because there are no nails, splinters, or loose boards. 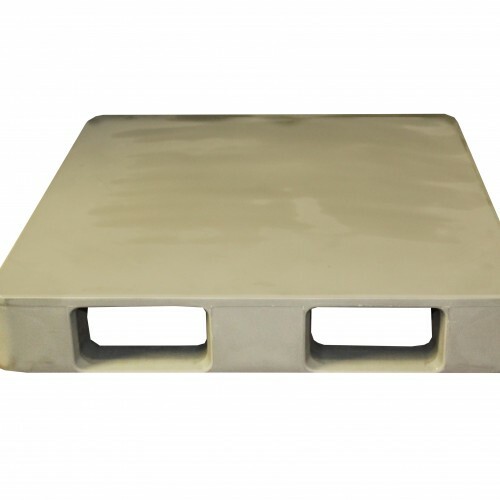 Nonporous polyethylene resists dirt and contamination build-up as seen with wood pallets. Easy to clean by simply hosing down with soap and water; no difficult to clean holes or crevices as commonly seen with injection-molded pallets. Made with FDA-compliant 100% virgin polyethylene and pigments for safe use in regulated industries. Long lasting design means you save money in the long run and reduce waste. Can be racked if there is a center support. 5000 lbs. static load, 2500 lbs. dynamic load, 2500 lbs. load racked with center rack support. Pallet jacks enter and exit these fork pockets effortlessly and make handling a breeze. This flat deck, easy to clean, FDA-compliant polyethylene pallet has fork pockets on each side allowing easy 4-way entry and safer forklift handling, especially in higher racking systems. There are no crevices or holes for contamination to hide and we guarantee they will last much longer and are more durable than brittle injection-molded counterparts. 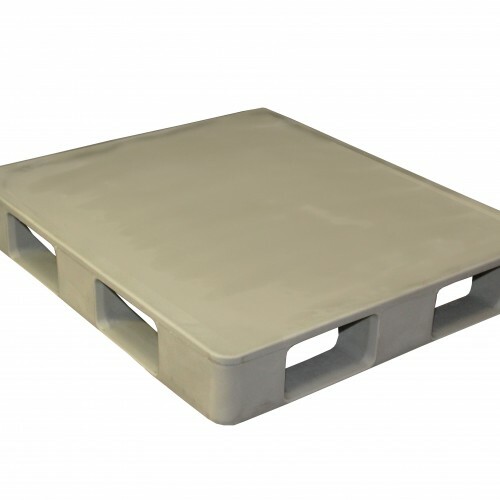 Unlike similar pallets with fork pockets, this pallet is specifically designed for easy entry and exit of pallet jacks. The pallet jack enters the pockets effortlessly and it can be removed just as easily. Many similar pallets get caught on pallet jack wheels and it is a struggle to remove the forks. As an added feature, there is a continuous bottom rail on this pallet which makes it ideal for use on conveyer systems.